We offer high quality range of M.S. 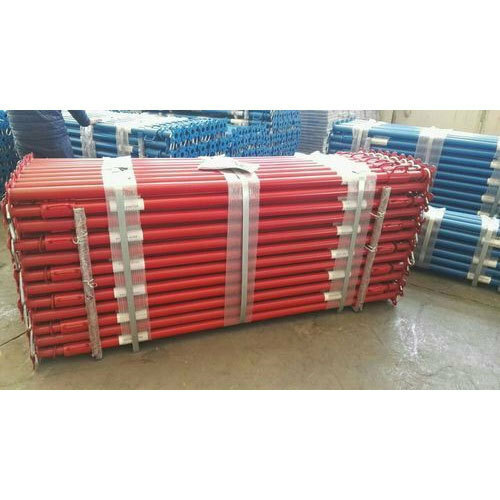 Steel Telescopic Props to the customers. This product can be used in all types of building construction; as a result they are widely demanded in the market. 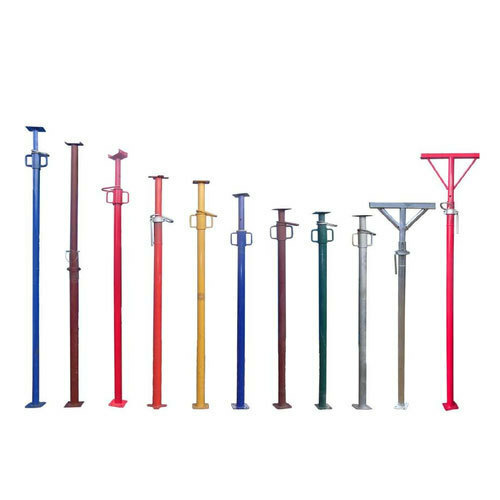 In addition, these are ideal to be used in the applications wherever need of adjustable perpendicular load bearing. These Prop made from 50 NB (60.3mm OD) M. S. Round 'B' class Pipe as outer and 40 NB (48.3mm OD) M.S. Round 'B' class Pipe as inner, which slides in & out for adjusting the height as required with support of malleable cast iron nut and bottom is M.S. Base Plate of size 150*150*6mm with CO2 MIG welded and for top we offer as per the requirement prop head available in L type, Tilt-up (V Type) Head, U Head and Standard Flat Type and painted with ‘Dipped’ using oxford enamel deep blue color. This product is ideally supporting for Slabs, Beams, and Walls. We are looking bulk inquiries from Mumbai, Chennai, Kolkata, Bangaluru, Ahmadabad, Hyderabad, Lucknow, Kanpur, Varanasi, Jaipur, Jodhpur, Ajmer, Bikaner, Kota, Udaipur, Bhilwara, Alwar, Agra, Meerut, Aligarh, Allahabad, Banaras, Mathura, Jhansi, Ghaziabad, Noida, Bareilly, Moradabad, Saharanpur, Uttar Pradesh, Punjab, Chandigarh, Jalandhar, Amritsar, Ludhiana, Bathinda, Pathankot, Patiala, Hoshiarpur, Himachal Pradesh, HP, UP, MP, Shimla, Dharamshala, Uttrakhand, Dehradun, Haridwar, Roorkee, Rudrapur, Rishikesh, Nainital, Udham Singh Nagar, Indore, Bhopal, Jabalpur, Gwalior, Ujjain, Sagar, Ratlam, Satna, Dewas, Gujrat, Surat, Vadodara, Rajkot, Bhavnagar, Jamnagar, Gandhinagar, Karnataka, Davanagere, Belgaum, Hubli, Chitradurga, Tamilnadu, Coimbatore, Madurai, Salem, Trichy, Tiruppur, Erode, Vellore, Kerela, Kochi, Thiruvananthapuram, Kozhikode, AP, Andhra Pradesh, Visakhapatnam, Vijayawada, Warangal, Guntur, Nellore, West Bengal, Asansol, Siliguri, Durgapur, Bardhaman, Bihar, Patna, Gaya, Bhagalpur, Muzaffarpur, Jharkhand, Jamshedpur, Dhanbad, Ranchi, Assam, Guwahati, Agartala, Shillong, Haryana, Karnal, Ambala, Panipat, Rohtak, Hisar, Faridabad, Gurgaon, Maharashtra, Pune, Nagpur, Thane, Nasik, Aurangabad, Rajasthan, Goa, Jammu, Srinagar, J&K, Chhattisgarh, Raipur, Bhilai, Bilaspur, Korba, Odisha, Bhubaneswar, Cuttack, Rourkela, Navi Mumbai, Virar, Kalyan, Bhiwandi, Puducherry, Raipur, Raigarh, Banglore, Allahabad, Gorakhpur, Chennai, Hyderabad, Telangana, and all over India. Our experienced professionals are very much focused on manufacturing and supplying Scaffolding Prop in Ghaziabad India. To our respected clients. Specialists give attention to make these couplers as per clients’ choice and recent trends. These props are made from anti-corrosive materials and raw materials are being supplied by esteemed dealers. Users can avail such at very economical rate. • Best grade materials We have many satisfactory customer in below mentioned cities. Mumbai, Chennai, Kolkata, Bangaluru, Ahmadabad, Hyderabad, Lucknow, Kanpur, Varanasi, Jaipur, Jodhpur, Ajmer, Bikaner, Kota, Udaipur, Bhilwara, Alwar, Agra, Meerut, Aligarh, Allahabad, Banaras, Mathura, Jhansi, Ghaziabad, Noida, Bareilly, Moradabad, Saharanpur, Uttar Pradesh, Punjab, Chandigarh, Jalandhar, Amritsar, Ludhiana, Bathinda, Pathankot, Patiala, Hoshiarpur, Himachal Pradesh, HP, UP, MP, Shimla, Dharamshala, Uttrakhand, Dehradun, Haridwar, Roorkee, Rudrapur, Rishikesh, Nainital, Udham Singh Nagar, Indore, Bhopal, Jabalpur, Gwalior, Ujjain, Sagar, Ratlam, Satna, Dewas, Gujrat, Surat, Vadodara, Rajkot, Bhavnagar, Jamnagar, Gandhinagar, Karnataka, Davanagere, Belgaum, Hubli, Chitradurga, Tamilnadu, Coimbatore, Madurai, Salem, Trichy, Tiruppur, Erode, Vellore, Kerela, Kochi, Thiruvananthapuram, Kozhikode, AP, Andhra Pradesh, Visakhapatnam, Vijayawada, Warangal, Guntur, Nellore, West Bengal, Asansol, Siliguri, Durgapur, Bardhaman, Bihar, Patna, Gaya, Bhagalpur, Muzaffarpur, Jharkhand, Jamshedpur, Dhanbad, Ranchi, Assam, Guwahati, Agartala, Shillong, Haryana, Karnal, Ambala, Panipat, Rohtak, Hisar, Faridabad, Gurgaon, Maharashtra, Pune, Nagpur, Thane, Nasik, Aurangabad, Rajasthan, Goa, Jammu, Srinagar, J&K, Chhattisgarh, Raipur, Bhilai, Bilaspur, Korba, Odisha, Bhubaneswar, Cuttack, Rourkela, Navi Mumbai, Virar, Kalyan, Bhiwandi, Puducherry, Telangana, Hyderabad, Allahabad, Gorakhpur and all over India. Provided by us is a quality-assured range of Adjustable Prop to the esteemed customers. These products are extensively used in several industries and sectors for catering to their varied needs in the mat effective manner. We also customize these products as per the exact specifications provided by the customers. In our product range, we offer Scaffolding Props, Angle Heads, U Heads, Beam Heads and Adjustable Props to the clients. 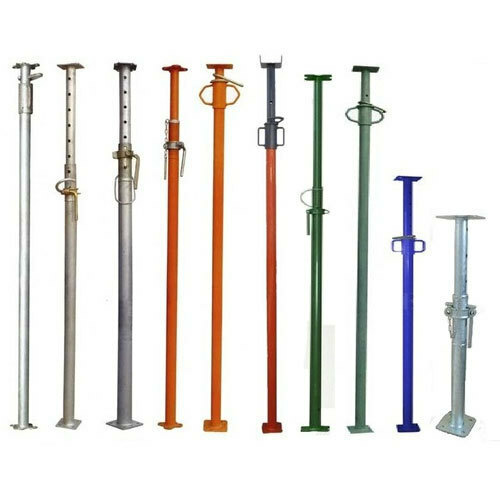 We are instrumental in offering a high-quality Adjustable Telescopic Shoring Prop to the customers, as per their demands. These products can be used in all types of building construction, thus, are widely demanded in the market. Moreover, these are ideal to be used in the applications where there is a need for adjustable vertical load bearing member. Push Pull Prop offered is designed and developed by the experienced team of professionals who have with them extensive knowledge and expertise in the handling of the involved manufacturing procedures. As a specialist in this field, we give due attention to ensure the design and finish standards as available in these push-pull props are exactly as per the end work needs. 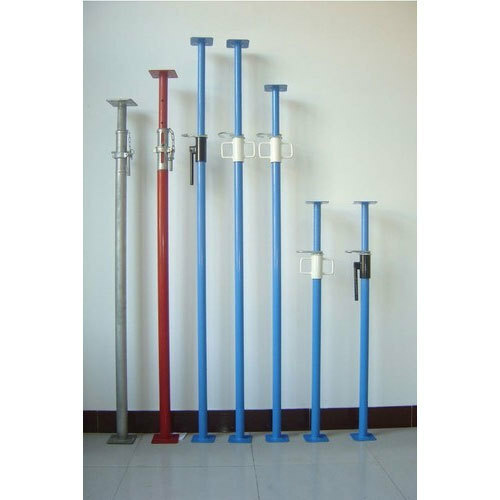 These heavy-duty push-pull props find use with walling systems for achieving accurate plumbing in walls that are over 3 meters in height. Further, the construction of these push-pull props from anti-corrosive material also makes these long-lasting in the finish. Dimension 2X2, 2X3, 3X3 MTR. Provided by us is a quality-assured range of Telescopic Props to the esteemed customers. These products are extensively used in several industries and sectors for catering to their varied needs in the mat effective manner. We also customize these products as per the exact specifications provided by the customers. 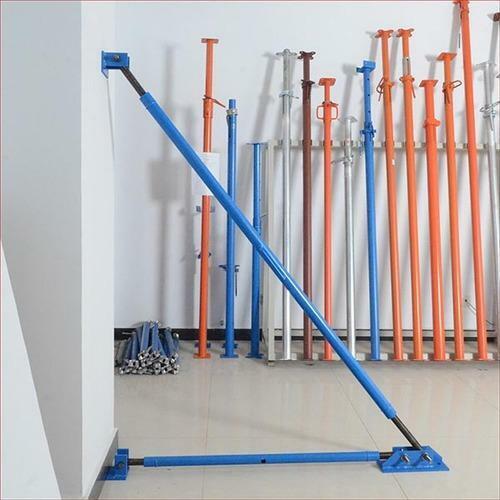 In our product range, we offer Scaffolding Props, Angle Heads, U Heads, Beam Heads and Adjustable Props to the clients.